A veteran Russian cosmonaut, a Japanese flight engineer and a NASA scientist-astronaut undocked from the International Space Station and returned to Earth Saturday, landing on the steppe of Kazakhstan to close out a 115-day mission. With Soyuz MS-01 commander Anatoly Ivanishin at the controls, flanked on the left by flight engineer Takuya Onishi and on the right by NASA’s Kate Rubins, the charred descent module settled to a jarring rocket-and-parachute-assisted touchdown east of Dzhezkazgan at 11:58 p.m. EDT (GMT-4; 9:58 a.m. Sunday local time). 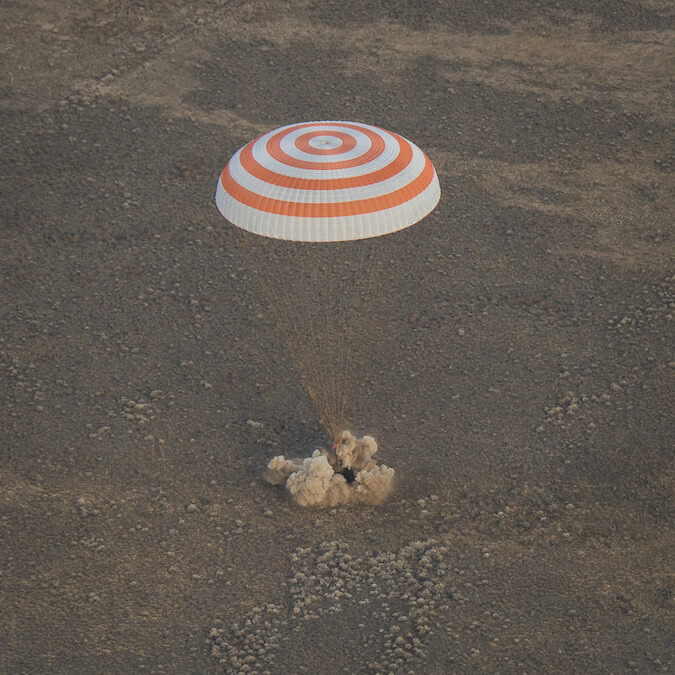 Russian recovery crews deployed nearby reached the capsule within minutes to help the returning station fliers out of the cramped descent module as they began re-adjusting to the unfamiliar pull of Earth’s gravity — and its weather. The crew was greeted by an overcast sky and temperatures in the low 30s Fahrenheit. Looking fit and in good spirits despite the chill, Ivanishin, Onishi and Rubins were carried to nearby recliners where they were draped in blankets before initial medical checks and satellite phone calls home to friends and family. The recovery team planned to fly the crew by helicopter to Karaganda for a traditional Kazakh welcome-home ceremony. From there, Ivanishin planned to fly back to the cosmonaut training center in Star City near Moscow while Rubins and Onishi boarded a NASA jet for the long flight back to the Johnson Space Center in Houston. Left behind in orbit were Expedition 50 commander Shane Kimbrough, Sergey Ryzhikov and Andrey Borisenko, who reached the space station on Oct. 21 aboard the Soyuz MS-02 spacecraft. They will have the station to themselves until Nov. 19 when three fresh crew members — Soyuz MS-03 commander Oleg Novitskiy, European Space Agency flight engineer Thomas Pesquet and veteran NASA astronaut Peggy Whitson — arrive two days after their own launch from Baikonur. For Ivanishin, Rubins and Onishi, touchdown closed out an action-packed, research intensive mission spanning 1,840 orbits and 48.7 million miles since launch from Baikonur on July 6. Over the course of the mission, the crew welcomed a Russian Progress supply ship, a SpaceX Dragon freighter, an Orbital ATK Cygnus cargo craft and the Soyuz MS-02 spacecraft that brought Kimbrough’s crew to the station. Rubins, who holds a doctorate in cancer biology, participated in two spacewalks totaling 12 hours and 48 minutes and carried out pioneering DNA sequencing experiments in space. “Expedition 49 to International Space Station is coming to its end,” Ivanishin said Friday as he handed command over to Kimbrough. “I think time is a very interesting and not fully understood phenomenon. I have a feeling that we came to the space station just yesterday, and tomorrow it’s time for us to undock and go back to our planet. Reluctant to leave or not, Ivanishin, Onishi and Rubins floated into the MS-01 spacecraft and closed the hatch around 5:12 p.m. and undocked from the station’s Rassvet module at 8:35 p.m. The Soyuz MS-01 spacecraft was the first in a new series of upgraded ferry craft, featuring improved communications, navigation and propulsion systems, along with increased redundancy. While two MS spacecraft have been launched to this point, Ivanishin’s crew was the first to put the upgraded spacecraft through its paces for re-entry and landing. Moments after undocking, Ivanishin carried out a series of tests, manually firing the ship’s maneuvering thrusters to verify the system’s performance. The tests went well and at 11:06 p.m., the crew fired the ship’s braking rockets for four minutes 37 seconds, slowing the ship by about 186 mph. That was just enough to drop the far side of the orbit deep into Earth’s atmosphere as planned. Twenty-two minutes later, the three modules making up the MS-01 spacecraft separated and three minutes after that the central crew module fell into the discernible atmosphere at an altitude of about 62 miles. Oriented heat shield first, the descent module endured temperatures of some 2,500 degrees as it fell through the zone of peak heating, falling from 50 miles up to an altitude of about 20 miles, rapidly slowing and subjecting the crew to three to four times their normal weight. 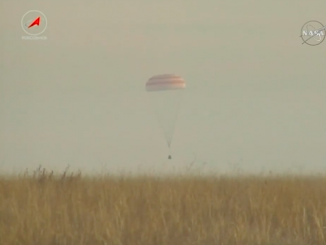 At an altitude of about six-and-a-half miles, a large parachute was deployed, slowing the descent module still more. 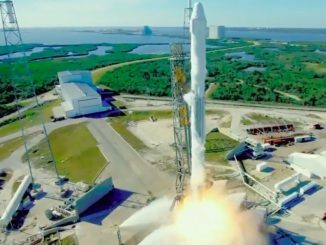 Finally, an instant before touchdown, small rocket motors fired to sharply reduce the vertical velocity to just a few miles per hour. With the Soyuz MS-01 crew safely home, Russian engineers will press ahead with preparations to launch the next spacecraft in the series, the Soyuz MS-03 ferry craft, to carry Novitskiy, Pesquet and Whitson to the station. 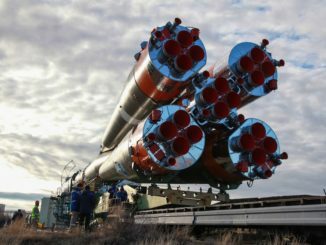 Launch from the Baikonur Cosmodrome is targeted for Nov. 15 with arrival at the space station expected two days later.